The Fed must be happy. The employment numbers “confirm their view”! They are right. That´s the way the Fed thinks. But it is dangerous and wrong! Insisting on the mistake will likely lead to another recession. Larry Kudlow (HT Lars Christensen) also rants on the Fed´s mistaken view. Some illustrations for the past 22 years will help identify the mistake. Note how inflation and unemployment reacted to the productivity shock of the late 1990s. Note also how the negative AD shock of 2008 affected unemployment and inflation. Many at the FOMC like to appeal to “special causes” for the low inflation. A favorite is oil prices. 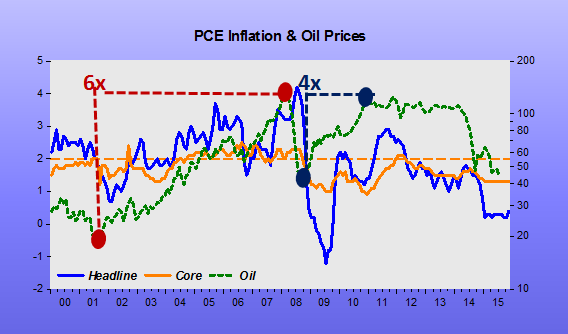 However, the next chart shows that while oil prices have “jumped & tumbled”, core inflation has remained subdued. Note that in 2007-08 the economy was buffeted by both a negative AD shock and a negative supply (oil) shock. In that case both the AD curve and AS curve shift to the left. This solves the “puzzle” frequently mentioned of “why didn´t inflation fall even more”. The negative AS shock “supported” inflation. However, the negative AD shock was so strong that it ended up “annulling” the supply shock, with oil prices tumbling, at which point inflation dropped. And Lacker is worried about an “inflation conundrum” (title has changed)! Now, let´s look at things from a NGDP perspective. Much better, I think. The productivity shock after 1997 reduced unemployment and inflation. 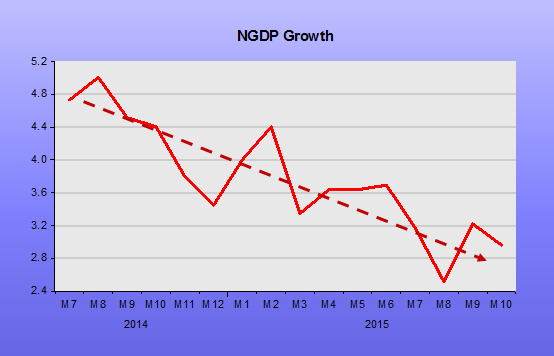 Keeping monetary policy (NGDP growth) steady was key to the outcome. 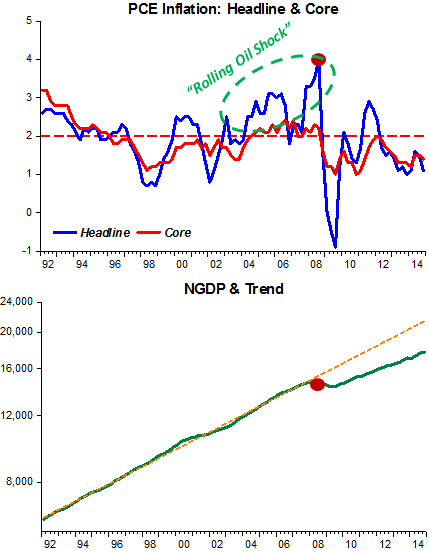 However, in 1999/00, NGDP growth was a bit excessive and the reaction resulted in too much tightening. 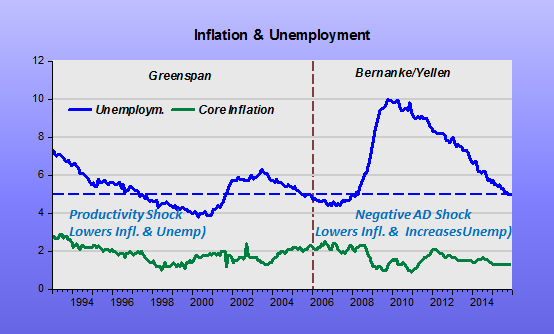 In 2003-05, the mistake was corrected, with unemployment falling and inflation remaining close to target. Bernanke reacts to the oil shock by tightening monetary policy (allowing NGDP growth to fall unadvisedly (“let´s ball drop”). The mistake was compounded by “losing the ball”, after which the “net was permanently lowered” i.e. 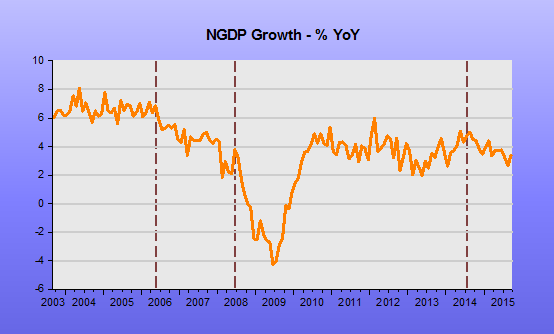 NGDP growth never rose sufficiently to take spending to the previous trend level. During the first leg of the oil shock in 2002-05, monetary policy was “expansionary”, to offset the previous “tightening”. Note from the second chart from the top, that inflation remained well behaved. Despite the oil shock, real output growth rebounded. Bernanke “dropping the ball”, combined with the second leg of the oil shock, strongly decreased real growth. When the “ball was lost”, real growth tanked. The price of oil tumbled as a result of the strongly negative AD shock. Substantively, our results support that an important part of the effect of oil price shocks on the economy results not from the change in oil price per se, but from the resulting tightening of monetary policy. This finding may help explain the apparently large effects of oil price changes found by Hamilton (1983) and many others. He certainly proved his point in 2007-08! What the above discussions tells me is that monetary policy should not be informed by the rate of unemployment, what´s happening to oil prices or whatnot. A focus on NGDP growth relative to a “desired trend path” is all that´s needed. The Fed seems to be making the same error again, this time by focusing on unemployment instead of oil prices. So it´s not at all surprising to see real and financial indicators also going south. Just to give two examples; the Institute of Supply Management diffusion index (ISM) and long term inflation expectations from the 10 year breakeven. If these trends continue, and the Fed seems set on keeping them going, the likelihood of a recession will be increasing as the year progresses. Conventional wisdom suggests lower oil prices should provide a shot in the arm for the global economy. In current circumstances, however, lower oil prices may simply be providing over-enthusiastic central bankers with an opportunity to shoot themselves in the foot. Inflation is likely to move back to the U.S. central bank’s 2% annual target in the “near-term,” said Richmond Fed President Jeffrey Lacker, on Thursday. “After the price of oil bottoms out, I would expect to see headline inflation move significantly higher,” Lacker said in a speech to the Chamber of Commerce in Raleigh, N.C.
Lacker is a hawk on the Fed’s interest rate committee, having dissented at the Fed’s September and October meetings in favor of an increase in interest rates. He is not a voting member of the Fed policy committee this year. His visual capacity is nil! What would he think after looking at a chart like this? Between 2001 and 2008, oil prices went up by a factor of 6. 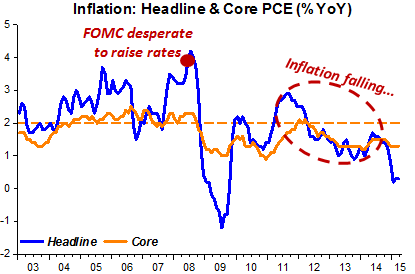 Headline inflation went up but core inflation was very well behaved, staying close to “target”. Between December 2008 and January 2011, oil went up by a factor of 4, and remained at that high level for the next 37 months. Headline inflation quickly moved below target before tanking with the drop in oil after early 2014. Meanwhile, core inflation was significantly below target for most of the last seven years. He thinks oil price is the driver of inflation, when it only determines the swings in headline inflation. That misguided thinking has already brought much grief! Think instead that monetary policy determines trend inflation, and look at core inflation as “trend inflation”. In that case, if you are “hawked” on headline inflation you will be “busy”, but will also do a lot of harm! An AD shock spits in their faces but they don´t feel it! He gets it wrong on both counts! The chart shows daily 10-year breakeven inflation and oil price. Between mid-2003 and mid-2008, there were two back to back significant oil shocks, with prices more than quadrupling over the period. Note that despite the strong increase in oil prices, inflation expectations remain stable, even falling and becoming more stable during the second leg of the shock. The reason the oil shock did not affect inflation expectations will be seen below. Notice, however, that when a gargantuan negative demand shock hits, oil prices and inflation expectations tumble. Later, when the environment turned “peaceful” again, oil prices stabilized at a high level and inflation expectations fluctuated quite a bit, but showed no trend, responding to the on/off nature of monetary policy (the QE´s). And when the taper begins, inflation expectations “settle down”. 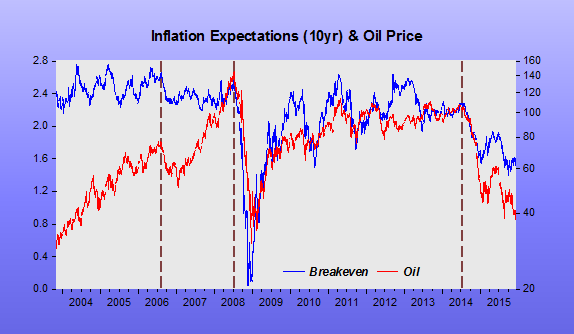 In mid-2014, oil prices and inflation expectations drop significantly. This is consistent with a negative demand shock. In this case the oil price drop is not “making everybody better off”, but is a reflection of reduced nominal growth expectations, “making everyone worse off”! 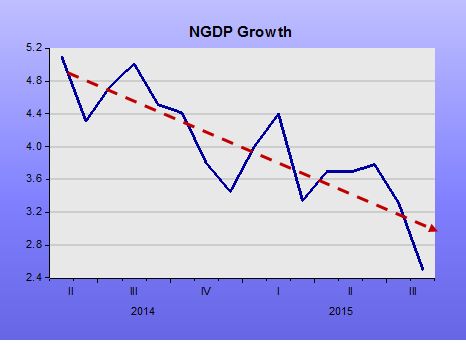 When I put up the chart showing NGDP growth, things become clear. The reason rising oil prices did not increase inflation expectations in 2003-08, is due to the fact that, contrary to what happened in the 1970s, NGDP growth remained stable (in the 70s it showed a rising trend). Interestingly, in 1997 Bernanke had said that the impact of an oil price shock depended on the behavior of monetary policy! As soon as Bernanke takes over at the Fed, NGDP growth drops, which is consistent with the fall in inflation expectations observed in the first chart. When NGDP growth sinks, so does inflation expectations and oil prices. This is the prototype negative AD shock. More recently, the Fed has talked a lot about policy “normalization”. But the simultaneous fall in inflation and inflation expectations make them sound “funny”. To counter that impression, they allege that the low inflation observed is a temporary thing, associated with the fall in oil prices, and that this effect will soon “dissipate”. And in order for the Fed not to fall behind the (inflation) curve, they have to “act” now! They miss the fact that the joint behavior of oil prices and inflation expectations is reflecting the fall in nominal growth expectations. In fact, since the middle of last year, monetary policy, as gauged by NGDP growth has been tightening. But our genius monetary policy makers think monetary policy has been extremely accommodative! On the 16th they are likely to throw salt in the wound. Any pain will likely be temporary because the economy has been “duly prepared”! To support continued progress toward maximum employment and price stability, the Committee today reaffirmed its view that the current 0 to 1/4 percent target range for the federal funds rate remains appropriate. In determining [how long to maintain this] whether it will be appropriate to raise the target range at its next meeting, the Committee will assess progress–both realized and expected–toward its objectives of maximum employment and 2 percent inflation. There´s been no material change in the statement. They just wanted to keep the “this year” option on the table. But it won´t be exercised. Things change but they don´t budge from the view that inflation will settle near the target! Inflation is anticipated to remain near its recent low level in the near term but the Committee expects inflation to rise gradually toward 2 percent over the medium term as the labor market improves further and the transitory effects of declines in energy and import prices dissipate. The Committee continues to monitor inflation developments closely. The Committee also anticipates that inflation will settle, over coming quarters, at levels at or below those consistent with the Committee’s dual mandate as the effects of past energy and other commodity price increases dissipate further. However, the Committee will continue to pay close attention to the evolution of inflation and inflation expectations. And they consistently get it wrong! 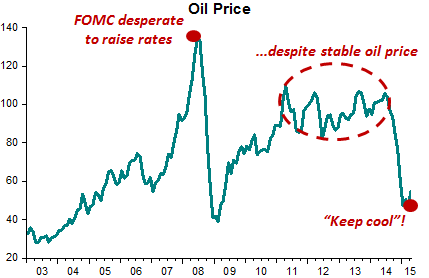 Four years ago, oil prices had climbed from $40 in mid-09 to near $100 in November 11 when the meeting took place. With oil prices stable after the steep climb, inflation did not settle near the target, it kept falling! Now they parrot-like repeat the meme that the downward pressure on inflation of the fall in oil prices will dissipate. It won´t, because the Fed has been tightening monetary policy for more than one year, as indicated by the NGDP monthly growth rate (from Macro Economic Advisers). That´s one of the reasons oil prices fell to begin with! The Fed is a “tighten-only screwdriver”! Anyone who knows me, or has listened to my speeches, will notice three recurring themes. The first, and foremost, is that monetary policy is data-driven. I am so data-focused that I literally had a T-shirt made to express my personal policy mantra. The second is that I think patterns and history are important indicators of our economic present and future—they are, frankly, just another form of data to be mined. As is the case with the effect that wages have on overall inflation, sometimes the theory doesn’t play out in practice, and history is an eloquent teacher. The third is that I believe policymakers have to be very careful about not reacting to blips. This again is an extension of the “data, data, data” view: We have to look at what’s happening in the economy not just today, not just this month, but over the medium term, analyzing trends and looking at multiple indicators. That’s why we should be very circumspect about reacting to short-term fluctuations in commodity or other import prices. Just as the Fed didn’t immediately intervene in the spring of 2011, when inflationary pressures from oil and import prices were going up, we shouldn’t jump the gun now that they’ve gone down. I take a perspective that looks one or two years ahead, which research shows is the minimum amount of time it takes for monetary policy to have its full effect (Havranek and Rusnak 2013). What I’m considering is what impact those factors that are currently unfolding—movements in the U.S. economy, weakness abroad, oil prices—will have not next week or next month, but later this year and the year after that and the year after that. My goal is policy that meets the needs of the path we’re on, not where we’re standing this second. With that in mind, history and experience show that energy price swings leave an imprint on inflation in the short term, but don’t affect underlying inflation rates over the medium term (Evans and Fisher 2011, Liu and Weidner 2011). The same holds true for movements in the exchange value of the dollar: They obviously affect inflation in the short run, but they don’t have much of an impact further down the road (Gust, Leduc, and Vigfusson 2010). I’m therefore looking at underlying rates of inflation. Fed economists are frequently accused of neither eating nor driving, because we prefer to measure “core” inflation, which excludes food and energy prices. For the average consumer, those matter a lot—you can’t talk about what a dollar can buy if you don’t look at those products. But for economic trends, and for guiding monetary policy, measures of inflation that remove the most volatile components, like core or “trimmed mean” inflation, give a better lay of the land (see FRB Dallas 2015). And here´s the “lay of the land” for the past decade or so. My bottom line is that I think the tail risks on the growth and financial side have moderated. I do think, however, that they remain significant. We cannot ignore them. I’m also becoming concerned about the inflation side, and I think our rhetoric, our statement, and our body language at this point need to reflect that concern. We need to begin to prepare ourselves to respond through policy to the inflation risk; but we need to pick our moment, and we cannot be halfhearted. When the time comes, we need to make that decision and move that way because a halfhearted approach is going to give us the worst of both worlds. It’s going to give us financial stress without any benefits on inflation. So we have a very difficult problem here, and we are going to have to work together cooperatively to achieve what we want to achieve. One answer might be that there is an asymmetry in FOMC thinking. 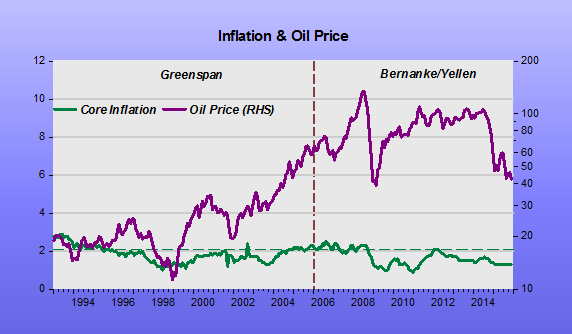 When oil (and commodity) price goes up, the risk to inflation rises, so policy must tighten. But when oil prices goes down, they shouldn´t be concerned (or react) about too low inflation. “Keep policy steady, but be prepared to tighten”! 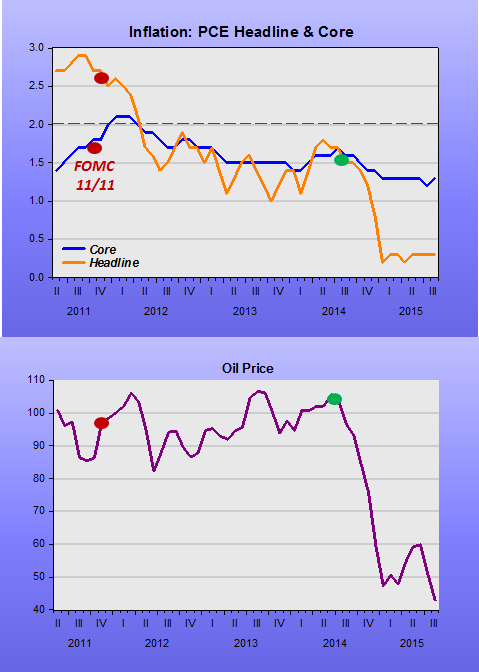 And note that between 2011 and mid-2014, both headline and core were coming down even though oil prices were stable! Why didn’t the most recent run-up in oil prices have dramatic effects as in the 1970s? Here one of the world’s leading macroeconomists surveys a variety of explanations: i) developed countries are now less energy-intensive, ii) wages are more flexible, iii) the US auto industry is relatively smaller, iv) monetary policy now targets core inflation, and recent shocks were to industrial demand, not oil supply. In sum, the search for an explanation of why oil shocks have smaller impacts now than they did in the 1970s has not come up empty. Rather, it has turned up a long list of factors, no one of which appears to be dominant, but each of which may play some role. If that is correct, the supply-shock explanation of stagflation remains qualitatively relevant today, but it is less important quantitatively than it used to be. Thus with luck and sensible policy, food and energy shocks need not have the devastating effects that the supply shocks of the 1970s and early 1980s did. The three highlighted sentences are key. The indirect effects of the run-up in oil prices were dramatic. And that was because (monetary) policy was neither lucky or sensible. Monetary policy was certainly not targeting core inflation!